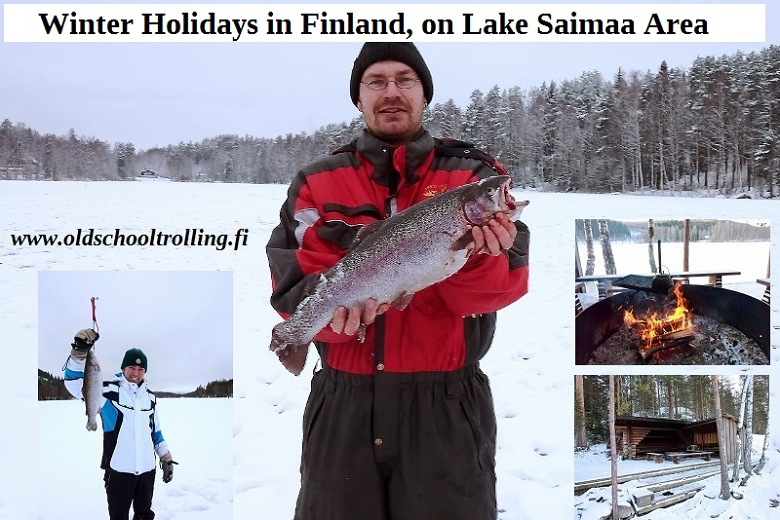 Welcome to have winter fun at Lake Saimaa, Finland! We are offering you a holiday in our well-equipped cottage in the best season of winter for recreation and ice fishing, as well as fishing with our professional fishing guide and company owner Jari Kayhko. The cottage is located right next to a lake and offers very easy access to do fishing, skiing or snowmobiling on the ice. All your necessary services are located within a radius of 3 km from the cottage: for example, a food store, restaurant, ski slopes, snowmobile trails, ice skating area and skiing trails. Our cosy and comfortable Fishing Cottage Jokiniemi is best suited and especially equipped for groups of sports fishermen of 4 to 6 people. The pond just 30 metres from the cottage is good for independent ice fishing of pike, perch, bream and roach. 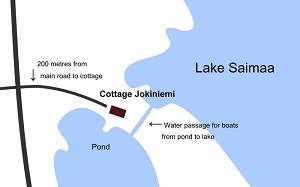 The actual Lake Saimaa area starts from a distance of 100 metres from the cottage. This area is excellent for ice fishing of zander, pike, perch, burbot, roach and bream. We arrange rainbow trout fishing trips at a privately owned lake, which is located 35 km from the Fishing Cottage Jokiniemi. There is a small shelter, fireplace and toilet at the area for your use. The distance from the parking place to the shelter is 100 metres and to the ice is only 30 metres. Excellent place for fishing with children. The rainbow trout in the lake are between 1 and 3 kg in size. You can catch and keep 3 trout / day / one license. Your fishing guide Jari Kayhko will teach you the best spots and tricks, and he will actively assist you with fishing rainbow trout. The price includes the necessary licenses and the use of fishing gear. 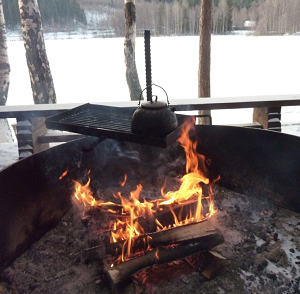 Also available tasty picnic by campfire for extra charge..
You can use three fishing rods at same time in this place, so we will use one rod for active ice fishing and two sets of tip-ups. We will use small spoons, balanced jigs, leeches and ice fishing jigs for active ice fishing and for the tip-ups we'll use fish eggs as bait. 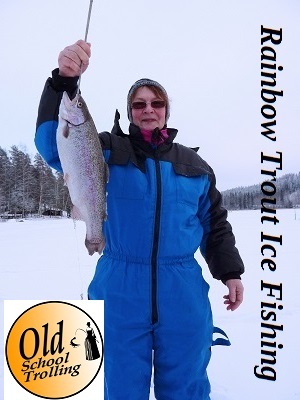 The price of one guided rainbow trout ice fishing day having duration of 6 - 8 hours is starting from 100 Euros / person (minimum charge is 250 euros / trip). 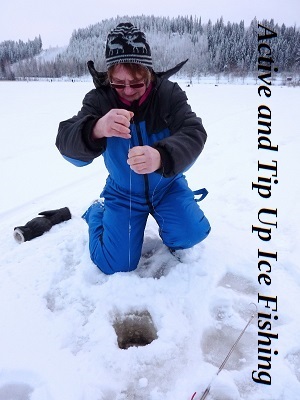 Ice fishing trips to places where you can catch pikes, perches, roaches and burbots by using active ice fishing and ismete icefishing gears. Participants must have warm clothes of their own. The price includes rent of our fishing gear and guidance. Available: December - April. The price of one guided ice fishing trip having duration of 6 hours is 75 Euros / person (minimum charge is 150 euros / trip). Rainbow trout fishing license: 17 Euros / fisherman / day. Family license for rainbow trout fishing (for father, mother and one child under 16 years): 25 Euros / day. Fishermen between 18 and 64 years of age must pay the national fisheries management fee to use Tip-up gears for rainbow trout fishing or Ismete angling gear for pike fishing (1 pc / 1 fisherman) in our cottage near by waters. Price National fisheries management fee is 15 eur / week. 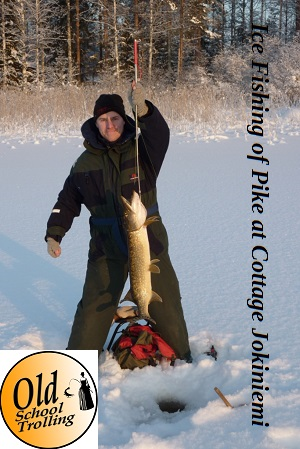 Fishing gear rental for independent ice fishing in our cottage or for rainbow trout ice fishing: 30 Euros / person / visit. 1) Having lunch on ice. Includes packed lunch and coffee and tea in thermos flasks. 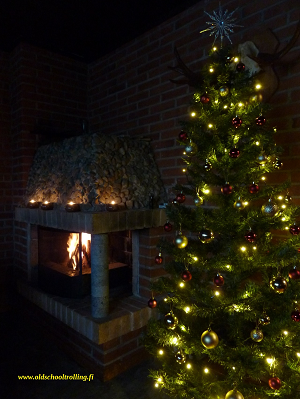 2) Having lunch around an open fire. Includes packed lunch as well as coffee, tea and sausages cooked on the open fire. The price of the picnic starts from 50 Euros / group. Christmas Eve is very special and the most important day over Christmas. It's traditional to eat rice porridge and plum fruit juice for breakfast. Then the Christmas tree is decorated. 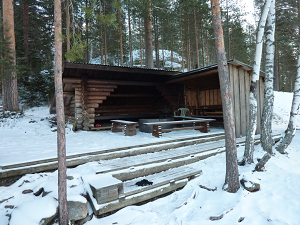 Most of finnish people like a relaxing sauna on Christmas Eve. The main Christmas meal is eaten in the early evening. Lutefish (salt fish) is the traditional starter, but is not so common nowadays. The main meal is a leg of pork served with mashed potato traditionally baked slowly in birch-bark boxes in the oven with similarly cooked mashed swede. Casseroles containing different vegetables including, rutabaga, carrot and potato are also common. Cured salmon is very popular and some people also have turkey. Desert is baked rice pudding/porridge eaten with spiced plum jam. One almond is hidden in the pudding. Whoever find the almond will be lucky for the next year. For all questions in English, please call + 358400523819 (Jari) or email jari@oldschooltrolling.fi (emails in English and Russian).